On the creation of Pakistan in August 1947, Anti Aircraft's share was just two regiments. 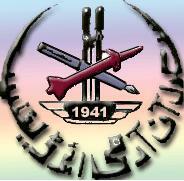 Merged with Pakistan Artillery, these units were renamed as 5 Heavy Anti Aircraft and 6 Light Anti Aircraft Regiments. 5 Heavy Anti Aircraft Regiment was the most technical and sophisticated unit of its time. It was the HIMAD Regiment of its time having 3.7" Radar Controlled Guns with a covering range upto 18 kms. It was capable of acquiring, tracking, computing and destroying all weather air intrusions at twenty two thousand feet automatically. Since PAF had yet to be created, the base of Air Defence in Pakistan was laid by 5 Heavy Anti Aircraft Regiment. The unit, therefore, was naturally selected by the Father of Nation, Quaid-e-Azam Muhammad Ali Jinnah for the unique honor of being the First unit of the Armed Forces of Pakistan to be inspected by him on 21 February 1948. Limited inductions of improved short range air defence weapons resulted in a commendable anti air craft performance in the 1971 war. Anti Aircraft was then accredited with 51 aircraft, 23 alone were shot down at Dacca Air Field by 6 Light Anti Aircraft Regiment, now 6 Light Air Defence Regiment. At the outbreak of hostilities the Anti Aircraft Arty was organized as one Army Air Defence Brigade (i.e. 3 Army Air Defence Brigade) having 12x Light Anti Aircraft Regiments, 2x (SP) Light Anti Aircraft Regiments, 3x Heavy Anti Aircraft Regiments, and 2x Independent Light Anti Aircraft Batteries. Out of these, 1x Light Anti Aircraft Regiment was deployed in East Pakistan. The worth mentioning performance was of 6 Light Anti Aircraft Regiment deployed in East Pakistan (Dacca) under the Command of Brigadier (the then Lieutenant Colonel) Muhammad Afzal, SJ (Late). The unit destroyed 23x air crafts and was awarded 4x SJs. "Miss Holingworth" a BBC War Correspondent described the performance of 6 Light Anti Aircraft Regiment as "It has been my great desire to see aircraft shot down by Anti Aircraft guns. Today when I am watching the duels between Indian pilots and Pakistani gunners, I can see the aircraft falling like toys. This is a world record for an Anti Aircraft performance." Anti Aircraft growth in Pakistan was relegated for the development of PAF and Artillery. Its need and importance in Air Defence was, however, highlighted by the Kashmir conflict in 1948, which resulted in some raisings. In the 1965 war even with favourable air situation, the importance and shortage of ground based Air Defence weapons were clearly brought out. Anti Aircraft was accredited with shooting down 49 enemy aircrafts in 1965. The 1971 War highlighted again the imbalance in the organization and development of Anti Aircraft. Anti Aircraft Command Headquarters was raised in 1975 to coordinate operational employment of all Anti Aircraft units in Pakistan. Anti Aircraft after 28 years of its existence was now to be coordinated operationally by Anti Aircraft Officers. The First General Officer Commanding Major General Iftikhar Muhammad brought in systematic and professional development of Anti Aircraft by developing a concept of surveillance and inducting the First Air Defence System after 1947 i.e radar controlled 57 mm Medium Anti Aircraft. It was a great contribution in environment of economic stringency. Being, then, a part of the Artillery, Anti Aircraft needs and priorities were neither comprehended nor given due weightage. Anti Aircraft development was relegated to a low key in the days of Martial Law. It was only in 1984 when the first comprehensive five year development plan aiming at total development of Anti Aircraft was conceived, approved and implemented on the orders of General Khalid Mahmud Arif. This comprehensive plan envisaged Modernization, Modification, Reorganization and Indigenization. Its concept of employment was tested and validated in Exercise Zarb-e-Momin. Army Air Defence as an operational and economical necessity had to be organized on a centralized command basis. This concept was approved for implementation in February 1991. This period spreading over a decade could be regarded as "Consolidation Phase" of Army Air Defence. The newly inducted equipment, weapons and technologies, in the shape of LAADS (Low Altitude Air Defence System) radars, RBS- 70 Missiles, Giraffe Radars, 35 mm Oerlikon Gun system along with Sky Guard Radars were absorbed; both at technical and tactical levels. This phase also saw increase in Air Defence formations and units. The employment concept and tactical doctrine were put to test and adopted subsequently. Army Air Defence was born on 23 March 1989, when it was separated from Artillerynd recognized as the youngest Arm of Pakistan Army, given the name 'Army Air Defence'. This was officially proclaimed on 10 October 1989. Army Air Defence successfully faced the challenge by reorganizing in harmony with its Concept of Integrated Air Defence. As Army Air Defence is a dynamic arm and it has to keep pace with the fast changing technology and ever increasing/changing air threat. Therefore, a "New Air Defence Concept" based on re-organization of Air Defence Units, selective modernizations and induction of new weapons and equipment was evolved. The same was presented at various forums and modified in the light of recommendations by various headquarters/ organization. As a result of extensive mutual discussions, exhaustive staff work followed by field trails of proposed organizations, the same was approved in October 2003.